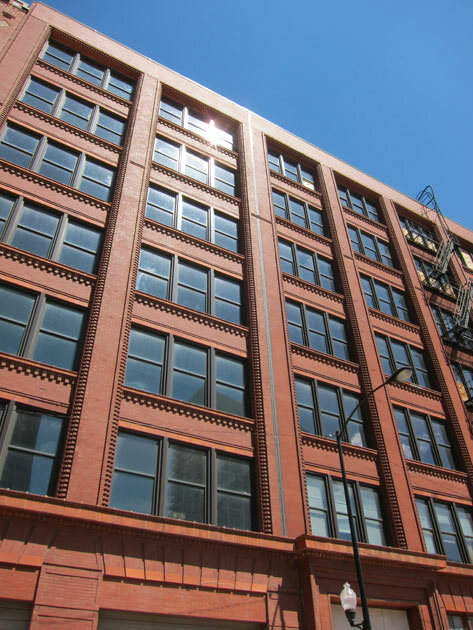 619 S. LaSalle, a historic seven-story commercial loft building in the landmarked South Loop Printing House District, is under construction. The building will be converted to residential use with 106 studio-, one and two-bedroom apartments. Designed by Holabird & Roche in 1903, 619 S. LaSalle features a distinctive façade and structural system. The LaSalle Street elevation features red face brick with terra cotta detailing, brick corbelling and “zippered” brickwork along the piers. The clay-tile arch structure has a steel frame and barrel vaulted ceilings. The building served as the headquarters and central plant of Brock & Rankin, a printer and binder of books, catalogues and encyclopedias. When the company vacated the building in the 1950’s, portions of the building were later remodeled for office use. The renovated lobby will feature several original features, including a historic metal stair, mosaic-tile flooring, and a passenger elevator cab. HPA also designed an amenity penthouse addition that will include an exhibition kitchen, fireplace lounge and game area, as well as an outdoor deck. The project is anticipated to be open for occupancy in summer 2015.